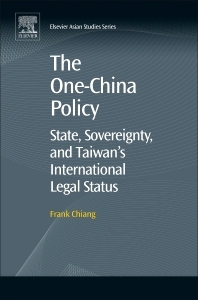 The One-China Policy: State, Sovereignty, and Taiwan’s International Legal Status examines the issue from the perspective of international law, also suggesting a peaceful solution. The book presents two related parts, with the first detailing the concept of the State, the theory of sovereignty, and their relations with international law. The second part of the work analyzes the political status of the Republic of China in Taiwan and the legal status of the island of Taiwan in international law. Written by a leading international expert in international law, this book provides approaches and answers to the question of Taiwan and the One-China policy. 5. Position of Lee Teng-hui on the political status of the R.O.C. 6. Position of Chen Shui-bian on the political status of the R.O.C. 8. Position of Ma Ying-jeou on the political status of the R.O.C. 9. Position of Tsai Ing-wen on the political status of the R.O.C. (2) The postBPeace Treaty interpretations of the U.S. and the U.K.
Frank Chiang is Professor of Law at Fordham University School of Law, and a Member of the New York State Bar. He has previously held many international academic and professional positions including as Visiting Professor of Law, Chuo University of Tokyo, and at the Japan Comparative Law Institute, also in Tokyo. By far the most complete and extensive legal treatise of the One-China Policy ever. This work is by far the most complete and extensive legal treatise of the One-China Policy ever. Professor Frank Chiang of Fordham Law School in New York goes into great detail in his analysis of this much discussed but little understood topic. The book received a glowing foreword by Prof. Jerome A. Cohen of the New York University of Law, and an incisive afterword by former US diplomat John J. Tkacik Jr. In Part I professor Chiang first defines and analyzes the history and legal definitions of the concepts of the state, sovereignty, and the territorial state, establishing a foundation for his treatment of Taiwan’s status in the later chapters. In Part III, he analyzes sovereignty over Taiwan before and under the US’ “One China Policy” and also goes into the UN’s position on sovereignty over Taiwan, as well as the legal and political status of Taiwan under international law. In Part IV professor Chiang goes into more detail on US policy towards Taiwan, and presents a number of recommendations. territory. A state acquires a piece of territory of another state only by a formal transfer of title -- a treaty. Prof. Chiang also analyzes a number of documents and declarations, such as the 1943 Cairo Declaration, the 1945 Potsdam Declaration, and even the 1971 UN Resolution 2758 – which are often quoted as having a bearing on Taiwan’s status – and concludes that none of them are relevant for Taiwan’s status: the first two were simply declarations of intent, and were not carried out, while the 1971 UN Resolution was about the representation of “China” in the UN, and didn’t even mention Taiwan. Prof. Chiang thus clearly distinguishes between the respective governments, the territories they control, and whether they have obtained sovereignty through a formal treaty. With his argument he debunks both the KMT governments after 1949 (which still claimed sovereignty over China) and the PRC government in Beijing, which claims sovereignty over Taiwan until this day. Prof. Chiang’s analysis does much to clarify the muddy situation from 1949 through the early 1990s, during which both the PRC and ROC governments claimed sovereignty over China and Taiwan. Under his analysis neither of the cross-claims had any legal basis. He also argues that during that time, the KMT had no sovereignty over Taiwan -- although it controlled the territory-- due to the fact that it never formally obtained sovereignty through a territorial treaty. US State Department documents show that for many decades this was also the position of the United States government. Matters get more complex after Taiwan’s transition to democracy in the early 1990s. Starting with President Lee Teng-hui, the successive governments argued that with democracy achieved, sovereignty belonged to the people, and that Taiwan/ROC was a state. Professor Chiang disagrees, saying that a state can only become a nation-state if there is a formal declaration to that effect. He thus subscribes to the “declaratory theory”, unlike his well-known Taiwanese colleague Chen Lung-chu, professor emeritus at the New York Law School, who has argued in favor of the “evolutionary theory”, under which an entity gradually evolves into a nation-state, as it fulfills the requirements of the 1933 Montevideo Convention, which is generally accepted as the definition of a nation-state: defined territory, permanent population, a functioning government, and the capacity to enter into relations with other states. The work is excellent in that it is highly readable, avoiding complex legal phraseology, and discussing the key issues in a clear fashion. On the minus side, somehow the author gets quite a number of dates and specific facts wrong: Chiang Kai-shek died in 1975, not in 1978 (p.137), the woman selling contraband cigarettes on 28 February 1947 was beaten by Monopoly Bureau officials, but did not die: a bystander was shot and killed (p. 132). Carnegie Mellon professor Chen Wen-chen died in 1981 after being question by officers of the Taiwan Garrison Command (one of the secret police organizations at the time), not by Military Security Guards (p.140). The Olympic Games agreement to use “Chinese Taipei” stems from the so-called Nagoya Resolution of 1979, not from 1988 (p.174). Under the former, Taiwan would need to declare itself an independent state. Under the latter, it is already a nation-state, and diplomatic ties will materialize as it asserts itself on the international stage as a free and democratic nation. Professor Chiang has provided an excellent basis for the undoubtedly extensive further analyses and intensive discussions to come.